The nuclear energy of the power plant is released from the atomic nucleus of a heavy element called uranium. Thus unlike a traditional power plant that consumes fossil fuels, a nuclear power plant consumes uranium. What actually happens to the uranium nuclei in a nuclear power plant? 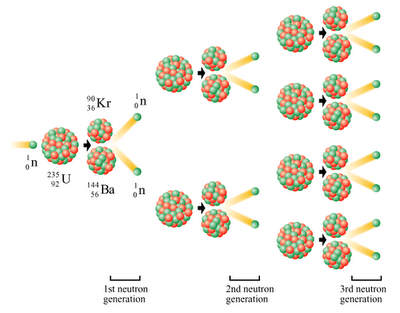 When a neutron collides with the nucleus of a uranium atom, the nucleus is split into two smaller nuclei in a process known as nuclear fission, releasing nuclear energy and emitting two or three neutrons. These released neutrons then collide with other uranium nuclei, producing further splitting and more energy. This continuous process of nuclear fission is known as chain reaction and a lot of energy is produced. A chain reaction is shown in the figure below. The nuclear power plant is divided into two main parts: the Nuclear Island and the Conventional Island. The Nuclear Island contains nuclear fuel in closed tubes packed together, collectively known as the reactor core. Nuclear energy is converted to heat energy in the reactor core. The Conventional Island is where heat energy received from the Nuclear Island is converted to electrical energy. Nuclear energy is converted to electrical energy in a nuclear power plant. The animation below will show you the inside of a nuclear power plant such as the Guangdong Daya Bay Nuclear Power Station.